Today is all rainy (again!!) and in the low 70’s (again!!) so in order to pretend like it’s still August and summertime I made a light and cold salad for lunch today. Boil the soba noodles in salty water until al dente (about 4 minutes). Drain and rinse them under cold water for a minute or two. Place noodles in a medium to large bowl. Drizzle with the sesame oil. In a small dish combine the soy sauce and rice vinegar, set aside. Slice the cucumbers in half first and then slice into half moon shapes. 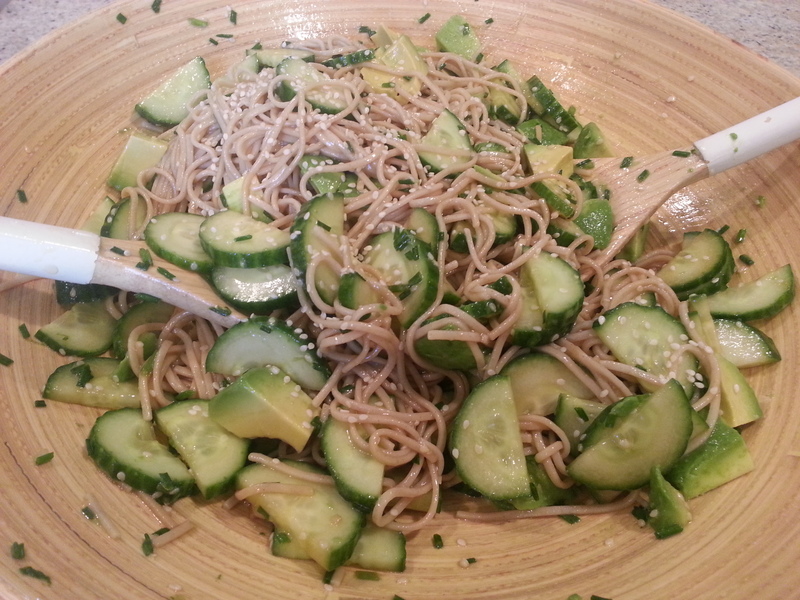 Add to the bowl with the soba noodles. Add chives and the soy sauce mixture to the noodles and toss everything together. Refrigerate for 30 minutes. When ready to serve, dice the avocado. Generously squeeze fresh lime juice over the avocado, then toss into the salad. Top with sesame seeds.